A Teddy Sweater for a change in behavior? Almost a year since I posted, where have I been on my happiness habit? Mentally it has been a difficult year for me. I was so upset with the USA presidential election results. I’m still edgy and upset and scared of the damage being done to my land and our relationships with other countries. A week before the election I had a major anxiety attack. This started in late evening, I went to bed and woke up feeling the walls closing in. I thought it was a heart attack. I waited and while I understood mentally that I was breathing and alive I felt that I could not breath. Called 911, the operator was kind and stayed with me until the ambulance arrived. The police also arrived a moment later. I live in the boro and response is quick. When transferring me to the ER, the EMT gave my problem as classic anxiety attack. Again I was put on oxygen and the hospital staff and doctor took good care of me. Five hours later I called for a taxi and was back home. I took the doctor’s advice and found a therapist. The first therapist was not a good fit for me. I spoke to the office and changed to another therapist. This time it is a good fit and I have been seeing her once a week for 10 months. Now we are going to try every other week and then taper off. We are now working on my controlling my anxiety (over future events that I have no control over) and staying in the present. Finding joy in each day, however small that joy might be. What has helped me is a new friend. In my water exercise class I overheard a lady talking about going to a museum. Bravely for me, I asked if I could join them. A few weeks later we had a grand time visiting the James A. Michener Art Museum in Doylestown Pa. From there Sandy and I started enjoying day trips to Bombay Hook Wildlife Sanctuary in Delaware, another time to a well known Amish shopping area, etc. It’s not every week but whenever we feel like taking a day trip. We are both in our 70’s, mentally I call us “slow and slower”, we both walk slowly and take many sit-downs along the way. Sandy has a positive attitude, and is determined to visit places far and near. When she broke her ankle and was unable to walk and was in rehab for months she promised herself that when she was able to walk again she would not stop. She hasn’t stopped. Am I cheerful and joyful all the time. Not yet, I’m working on it. Over the weekend because of rainy weather my plans changed. I was not as Eeyore as usual and adapted to the change. I had the fun of playing miniature golf in the dark with my grandkids, we used creative math scoring so we all won, the fun of playing an arcade game for the first time in my life, and the joy of watching Maria win 499 tickets on a game she played. And the joy of watching her and her younger brother pick out “prizes” with their won tickets. I am learning that happiness can be found in many ways, and that happiness makes me smiles, lowers my anxiety, and while I can’t change the election results, I can be happy in my own life. Over the summer while spending a few hours a week with Maria and her brother Johnny while Mom worked I taught Maria how to do needlepoint. On my last day of helping out over the summer I arrive in the morning, Mom greets me with a cup of tea and tells me Maria has a request. My granddaughter Maria gave me a challenge. Make a sweater for her Beary, her sleep friend, with her since birth and she is now nine. Thank goodness for online patterns. There are teddy bear sweater knit patterns on line. I chose a simple ribbing, stockinette stitch pattern. My knitting skills are still in the beginner stage. From my stash I chose a white with silver thread and have no idea why I originally bought this light weight yarn. Poor Beary, I didn’t have him to test the size out and when we put the sweater on him the sleeves hung down to his non-existent hips. His arms are one and half inches long. On my next try I used the sleeve measurement for the body, joining under the arms and at the neck. A much better fit, for sure. End of sweater making, right. Nope. During a conversation and laughing about the too big sweater I mention the sweater to my other daughter not knowing that her son also has a Beary, and she asks her son, Do you want Mimi to make a sweater for your Beary? Now my grandson, Dominick wants a sweater for his Beary. Back to the stash. Two weeks later on the three hour car ride to the ocean his sister reminds him often that he had to stop yelling at his mother or he would not get the sweater. When we arrived I felt his behavior had been and still was out of control, way beyond the terrible fours. I gave his mother the sweater and she gave him the sweater, hoping it would be a visual reminder of acceptable behavior. End of sweater making, right. Oh silly me. Dom is four and a half years old. When my daughter was pregnant with him there were markers for mental problems. My daughter and her husband decided to continue with the pregnancy. The markers disappeared. While a full term baby but small in size Dom at six months stopped growing and gaining weight. His life has been a series of doctors, tests and more hospitals with no reason for the growth problem. A mother’s love for her child got bottle after bottle of formula into him. At eighteen months old he had surgery to remove his tonsils so he could swallow. When on solid foods he became hungry and we thought all would be fine. He was eating 1500 calories a day. No weight or height gain. Now four and a half years later he is the size of a two year old. Mentally in some areas he is on average for his age, in some areas above average and emotionally below average. Dom has been tested for autism, his cousins on his father’s side have autism. He does not feel pain whether he has the pain or inflicts the pain on others. He is in therapy for many problems. He is tiny but strong. He doesn’t feel pain himself; he doesn’t understand that he hurts people, usually his sister and his mother. He has bruised his six year sister, he has previously broken his mother’s finger. Day three of vacation at the ocean, his father who drove separate from us, is, as usual, off doing whatever away from his family. My daughter has started to call herself a single parent. Three days and I had witnessed many nasty outburst from Dom directed to his mother. When I came into the condo I heard about what had happened. Dom didn’t want to put the ipod down to change into a swim suit. The family was going to the beach. He hurled a metal object at his mother and hit her eye. We left the kids with their father and went for a drive. How do you handle a child who doesn’t care that he hurt his mother? Hours later my daughter asks me to make another sweater. She wants to use it as a bribe for good behavior. She whisks me to her car, we drive a good half hour to the nearest yarn store. I had planned to visit this store but not in this manner. A skein of J. C. Brett DK weight yarn and size 6 bamboo needles later I am out on the condo balcony listening to the surf and knitting a variegated blue sweater. By this time I had memorized the pattern. A few hours later the sweater was finished, I gave it to my daughter. I know Dom has problems but I could not forgive him for hurting my daughter, again. Days after we got home from vacation she gave him the blue sweater. He loves it. Daily he changes Beary from a white to a blue sweater. End of sweater making, maybe. Dom has requested a purple sweater. Maybe as a holiday gift? If his behavior improves between now and then. Yeah, I’ll make the sweater, I don’t know what else to do to try to help my daughter. Yesterday my blog when to cyberspace. painted the posts Tropical Oasis Valspar. I like the blue however the spray paint gave more of the effect I wanted. Unfortunately, I decided to buy a can of paint and use a brush. My fingers were hurting from pushing on the spray button. I painted the oramental post toppers Tropical Oasis. I went back and forth from adhesvie glue to Grillia glue and finally settled on Liquid Nails. Tomorrow I will use the glue. A HD employee helped me solve the picture hanging problem. Eye screws in the paintings and screws on the fence. 18gauge wire actually comes with a self attached cutter. Miracles of miracles. Tomorrow they will be hung on the fence line. A very pretty blue glass ball with copper and wind chimes, again from HD $20 – Got it home and the chain is messed up. I splurged and bought a clematis, lavender, and a yellow angel wing begonia. Al did not come and power wash as he said he would. In fact, I have not heard from him. By the way, I have six 40 pound bags of pea gravel in the trunk of the car. Hoping that the college kids will be outside and I can ask them to carry the bags. Plan to gravel the first 2 sections of the fence leading out from the front gate. Plan to paint the top of the table trays Tropical Oasis, that will use up the quart of paint.slowly the sideyard is shaping up. I have decided on french-casual-shabby-chic fairy garden theme. greyed wood fence, tropical oasis blue posts, tropical oasis (valspar paint from Lowe’s) wrought iron garden gate circa 1886. black rough wrought iron table from Homedepot. chair does not match but is comfy. buy three flat sided baskets from Lowes and plant with flowers, fairy villages, hang string of light bulbs along fence line using posts as hangers. yellow rose bush, knock out? 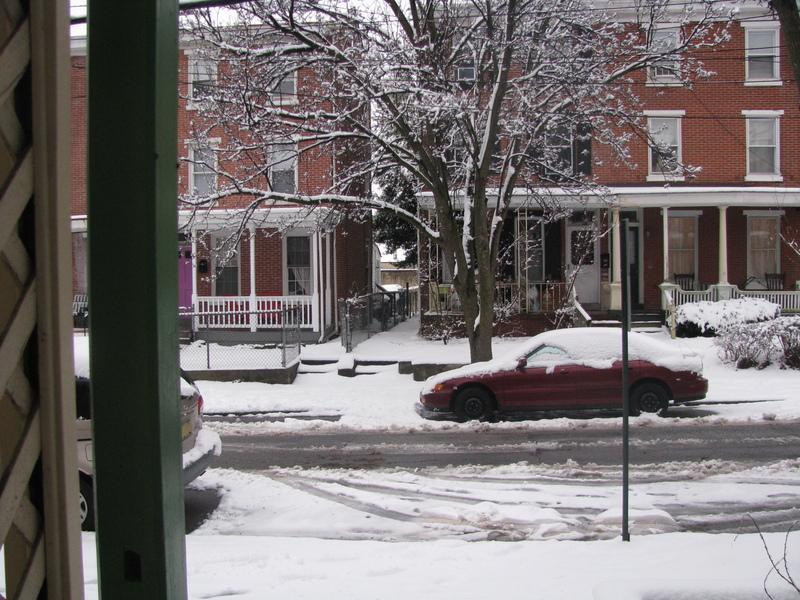 West Chester, PA First day of spring 2015.